The Plant's White Widow was originally sourced as a cutting from the Basque region in north-west Spain. 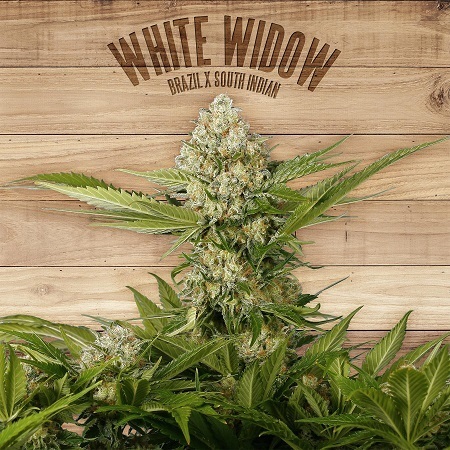 White Widow Feminized Cannabis Seeds by The Plant Organic Seeds: The Plant's White Widow was originally sourced as a cutting from the Basque region in north-west Spain. It is a 50/50 indica/sativa strain that is believed to have been created from the breeding of Brazilian and South Indian cannabis plants. This is a compact plant, rarely growing taller than a metre, and one which boasts such a profound covering of glistening resin crystals that it is impossible not to recognise how it came by its name - so thick is the resin that it gives the plants a striking white appearance in bloom. It can be grown easily indoors as well as outdoors even at fairly high latitudes. In the latter environment its resistance to pests gives it an added advantage. Indoor flowering takes roughly 8 - 9 weeks with northern hemisphere outdoor harvests taking place during the month of September. Yields are good with 400 - 450 gr/m2 from indoor plants while outdoors between 500 - 550 gr/m2 can be expected. The aroma is quite intense and somewhat spicy while the flavour is rather earthy in nature with some acidity. The effect of White Widow is well-known and it accounts for the fact that almost 25 years after its first appearance in Dutch Coffeshops it is still in great demand. Hard-hitting and long-lasting relaxation are the order of the day and, in all honesty, it can be a bit too strong for the novice smoker or vaper. With high levels of THC it is also a therapeutically useful cannabis strain which is used for pain relief and also to help combat the debilitating effects of insomnia.